One of the values I feel strongly about with my investment coaching practice is that I practice what I teach…and be transparent about it…good AND bad. It’s one thing for me to coach people how to make better decisions and develop and teach courses on how to buy and sell stocks and ETF’s. It’s another thing to model the behaviour. Throughout the year I’ve shared and tweeted (#trade2018) with you the investment decisions I’ve made throughout the year. Well it’s that time of the year where we get to scroll down the page and see what I what I did right and more importantly what I did wrong…and learn from the experiences of the past year that will help me become a better investor? After a decade of rising stock prices, the gluttony came to a thud in 2018 as stock prices finally decided to make a retreat. In early February there was a shot across the bow as stock prices sharply dropped. After the previous year of serenity with nary a move of greater or lesser than 1 percent, stock prices whiplashed at times dropping over 1000 Dow points in a day. It looked like the time finally had come for stocks to take that big reset, but if we know anything about the stock market is it has been Teflon’esque. A lot of things have been thrown at it, but nothing has stuck. After the dip in February, stock prices resumed their ascent and daily records were again the norm thanks to the Amazon’s and Apple’s which became Trillion dollar companies for a time. Then a different kind of Black Friday sale and Santa Clause rally came in November and December. It seems investors had finally had their A-Ha moment when it comes to holding stocks. With interest rates rising, investors finally realized and started to question why they were holding risky assets like stocks that pay lower dividend yields than holding a much lower risk bond that pays a higher interest rate. 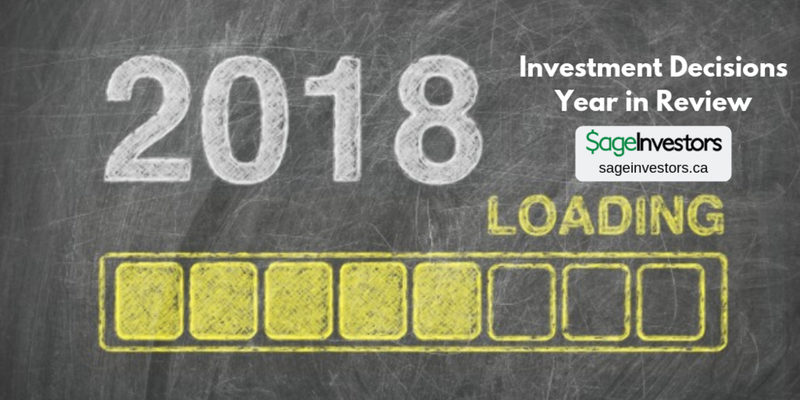 The dynamic was in play for most of 2018 but investors were ignoring. It seemed to change over the course of the year. Regular readers of my blog and listeners of my podcast will know that I’ve been quite negative on stocks and that I’ve been carrying a meaningful short position on the S&P500 for several, extremely painful years. It hasn’t done wonders for my portfolio, but I remained resolute to my belief that this epic bull run in stocks is not sustainable. The pull back in stock prices in 2018, finally gave my short position some legs and finally I saw some benefits, although I still remained in a negative on the position. At the same time, I’ve also at a micro level have continued to invest in individual stocks and ETF’s that I felt were trading at a discount. I’ve tried to still remain true to my investing strategy and ideology of buying high quality businesses at cheap prices and holding them until I achieve a meaningful return on them. I made a fair number of good decisions, but also a couple that didn’t pan out, but I was able to control the losses by staying true to my investing playbook. By having both a long and short position, in other words being somewhat hedged on both sides, I was able to absorb the shocks of the market this year. In 2018 I continued to manage a couple of other portfolios in my family. I setup and managed both my son’s RESP’s and a portfolio of another family member. Portfolio 1 contains my short position on the S&P500. RESP Portfolio 2 contained my position in General Electric which I sold at a loss and dragged the portfolio down. I’ve said many times that a good year is where returns for stocks are at or greater than the long term performance of stocks which is in the 6-8 percent range so based on this benchmark I would say it wasn’t a very good year. The other way to look at is to compare it basic market indexes. The S&P500 was down 6.3% and the TSX Composite was down over 11 percent, so from that perspective, I’m doing very well than the broader market. In other words the year was meh but when you look at it from a snapshot but when I look under the hood I see some good stories and learnings. I continue to be pretty good in staying true to my entry and exit strategies on individual stocks and ETF’s. When I’m losing money past a certain amount, I’ve sold and I had to do that a few times in 2018 with JD.com, Activision, and MGM. I lost money but if held them and not an exit strategy I would have lost even more money. Having that investing playbook to anchor to especially on days when the markets were tumbling allowed me to stay focussed and disciplined on how I make decisions. It allowed me to manage my emotions better, especially when it came to making those decisions to sell at loss. I made a lot of good successful decisions and I also made a few bad one’s, but because I stayed true to my playbook, those bad decisions were mitigated. I ended the year with my portfolios in about 63 percent cash, which is slightly lower than the previous year when I was just over 2/3rd’s in cash. If you look at it from a snapshot perspective the results were better this year because I stayed in cash and I got a bump in my short position. In previous years this has worked against me but this year I benefitted. I really want put more money to work as my investment horizons are getting shorter and at some point I will need to take out some risk in my portfolios as I get into the golden age of my years. At the same time, I managed to avoid FOMO (Fear of Missing Out) which was going around big time this year and invest in assets because of peer pressure. So at the snapshot level, not exciting but not a disaster like many are feeling, but when I drilled down into the numbers however, I continue to see some things that give me greater comfort. The thing about looking at returns at a macro level is that they are snapshots and provide little colour into the nuts and bolts of the portfolio namely the stocks and ETF’s. At the end, the output and success of our portfolios will be driven by the decisions we make on how to invest, and allocate our savings in our portfolios. This is much more tangible. The metric I focus most when evaluating my portfolios and just as importantly, my decision making capability, is realized return. This is a return generated when I actually sell a stock. When you sell a stock you are tangibly getting cash in your pocket and hopefully you will have made some investment decisions that will enable you having more cash in your pocket than when you started with. To me if I’m making a decision that results in me having more money at the end, then I think I’ve made a good decision. In 2018 I made 21 selling decisions. Below are the realized returns from those decisions. I sold 15 out 21 stocks for a profit. I made money. 13 out of the 15 were sold at a double-digit gain (at least 10 percent return) and 10 of those gains were at least 20 percent return or greater. Having said that the stocks I did sell at a loss were for higher dollar amounts and that brought down my overall realized return. The big thing is the losses were capped with the maximum loss being 28.5%. Having instilled a discipline in my investing playbook to sell stocks that cross my loss threshold, no questions was a big reason why. Overall the realized return on my completed investment decisions in 2018 was 1.47%. In 2017 it was 9.42%. In 2016 it was 19.5%. In 2015 it was 7.7%. In 2014 was 20.6% and in 2013 it was 3.92%. Not great compared to previous years, yet they were positive and the fact I’m making far more positive decisions than negative decisions means I’m at least going in the right direction. The way I make investment decisions now when it comes to buying and selling stocks is much different than when I started in 1996. It’s not totally about the quantitative side and the numbers game. I’ve become more in tuned with the qualitative, emotional, and behaviorial aspects of investing and that I think has helped me make better investment decisions. In my Everyday Investing courses I teach a module on how to manage our brains better. I continued to utilize market psychology more and more in framing my investment decisions. I am always looking for great companies that are on sale, and often those companies go on sale when either the overall market sentiment is tanking or the professionals are trashing the stock. As When I look at the list of stocks and ETF’s that I sold and the outcome of those decision, there is one common thread in each of them. All of these companies were out of favour by the market and talked down by experts or were operating in a weak business cycle within their industry. What’s interesting is that despite these takedowns, I observed that these companies were still creating tangible wealth and had very clean balance sheets so they can withstand the storms. From this perspective, I would consider these companies as less financially risky than a company that is at the altar of dependency on hyper growth (See Exhibit A: Snap Inc.). At some point I bought these stocks knowing that at some point the pendulum would turn and these companies will positioned for a ramp up in values. I had no clue when it would happen but I was prepared to be patient and wait when I bought these types of stocks. When we make investment decisions, we are in essence taking an educated guess on the long term performance of a company and the outcomes of those guesses take time to come to fruition. In determining my costs, I actually try to put a dollar amount to my costs and calculate those costs at as a percentage of total portfolios. Here’s what Excel spit out (numbers in brackets are 2016 costs). My costs went up this year. In recent years my costs were lower because I was buying less because I thought most stocks were expensive. This year with stock prices lower, a lot more stocks entered my radar screen and compelled me to make more trades. This year I doubled the amount of trades that I made from the previous year. In 2018 I made 104 trades. In 2017 I made 58 trades while in 2016 I made 50 trades. In 2015 I made 28 trades and in 2014 I made 32 trades. This year because I was buying more individual stocks, I was carrying more trading costs and less costs in terms of Management Expense Ratio costs (MER). The nature of the markets and pullbacks and the opportunity to buy some great companies at pretty discounted prices was pushing me to buy. It’s not a surprise that Portfolio 1 carried the highest costs given it was the portfolio that had the most expensive investment in my short position on the S&P 500. Despite the higher volume of transactions, overall for the total cost of all portfolios that I managed to come in at about 0.49 percent which is still pretty reasonable. To put some perspective, I manage 5 portfolio so 58 trades over 5 portfolios comes out to about 1-2 trades/month which is not a lot and is definitely not going to get me the brokerage companies giddy. My goals and strategy for 2019 will be no different from 2017, 2016 and no different from 2015, 2014, 2013, 2012 and so on so I’ll say it yet again. Despite my feelings that the stock market is ridiculously overpriced, I will still continue my discipline of working to identify opportunities to invest in great, well-managed companies that generate tangible economic profit and are being sold at a discount. One’s investment strategy and ideology should not change very much as deviation from the strategy is a recipe for trouble. All the best for 2019. Now get out there and make some cash!